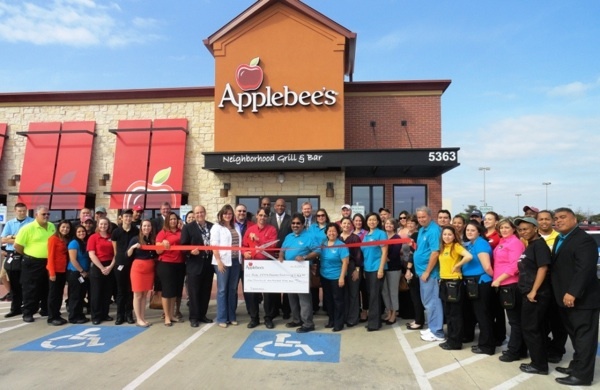 The award-winning Kyle Area Chamber of Commerce recently celebrated the opening of Applebee’s with a ribbon cutting ceremony. During the ceremony, Applebee’s Kyle presented a check to the Hays Education Foundation for $1,162. Dec. 5, 2012 - PRLog -- The award-winning Kyle Area Chamber of Commerce recently celebrated the opening of Applebee’s with a ribbon cutting ceremony. During the ceremony, Applebee’s Kyle presented a check to the Hays Education Foundation for $1,162. This money was raised during their opening day when they offered select free dinners to the community. The money that was donated at the event by patrons was then matched by Applebee’s to double the donation. The Chamber staff, members, Ambassadors and board of directors was accompanied by the Kyle City Council members, Mayor Lucy Johnson, and the Hays Education Foundation board members for the event. Applebee’s staff served attendees delicious appetizers from their menu, as well as soft drinks. Kyle Chamber of Commerce Executive Director, Ray Hernandez, welcomed and introduced everyone to Gerry Rush, the general manager of the new Applebee’s location. Mr. Rush addressed the attendees, expressing how excited he is to be a part of this expanding community, and to run the first ever Applebee’s location in Kyle. For more information on the Kyle Chamber of Commerce in Texas, visit www.kylechamber.org or call 512-268-4220. The Kyle, TX Applebee’s is part of the fast-growing area between Austin and San Antonio. For more information, guests can call their local Applebee’s or visit www.applebees.comor call 512-268-2362. Applebee’s (www.applebees.com) is the world’s largest casual dining chain, with approximately 2,000 locations in 49 states, 16 countries and one U.S. territory. Based in Kansas City, Mo., Applebee’s takes pride in providing a welcoming, neighborhood environment where everyone can enjoy the dining experience. Applebee’s Neighborhood Grill & Bar® is a DineEquity, Inc. brand, and is franchised and operated by Applebee’s Services, Inc. and its affiliates.